The Tabloid Witch is always looking for new opportunities to promote its past winning filmmakers -- at no charge to them or to audiences! Over the weekend of April 30 to May 3, 2009 (Thursday to Sunday), at the World Horror Convention in Winnipeg, Canada, the Tabloid Witch presented a special screening of The Best of the Tabloid Witch Awards (2004 - 2008), at the Marlborough Hotel. Two Tabloid Witch Award-winning films sent guests to the special screening: Miguel Gallego, writer/director of The Crypt Club (2007 Best Dramatic Horror Short Film), and Kelly D. Young, writer of H.P. 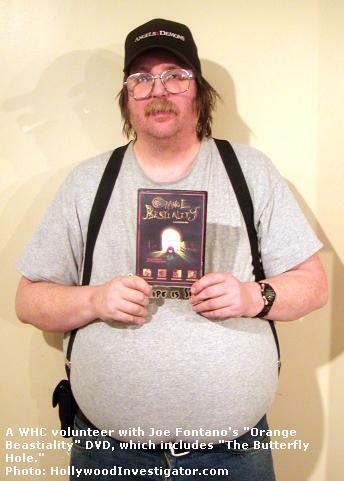 Lovecraft's Strange Aeons (2006 Best Supporting Actor, and Honorable Mention). In addition to directing, Miguel is an independent distributor, releasing award-winning (only!) short horror films on his Aaaaah! DVD label. 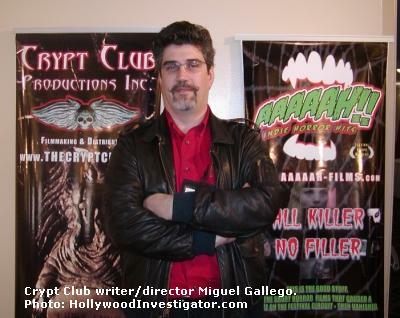 Miguel came to the World Horror Con prepared for business -- bringing promo banners for both his Crypt Club and Aaaaah! products. Kelly had no promo banners of his own, so he posed in front of Miguel's banners! Kelly's H.P. Lovecraft's Strange Aeons -- based on the Lovecraft short story -- "The Thing on the Doorstep" -- is distributed on the X label. 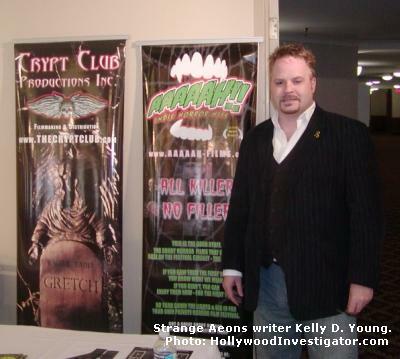 But World Horror Con is not just about films -- horror celebrities from all media attend World Horror! Artist Tommy Castillo -- who designed the Joker makeup in The Dark Knight! -- was there! So was writer/editor Joshua Gee, author of Encyclopedia Horrific: The Terrifying Truth About Vampires, ghosts, Monsters and More. Upcoming horror author Scott G. Browne (Breathers) hosted this year's Gross Out Contest. Several Tabloid Witch films found distribution opportunities and deals from the screenings. Canadian Linda Ross-Mansfield was impressed with 3:52 (2007 Honorable Mention), a supernatural tale of substance abuse, attempted suicide, and redemption in the Native American community, starring America Ferrera. Because Manitoba's large Native population suffers similar problems, Linda wants to promote and distribute 3:52 in Canadian schools. The Tabloid Witch put Linda in touch with 3:52 director Shawna Baca. Some filmmakers who couldn't attend WHC gave extra DVDs of their films to the Tabloid Witch, to pass on to fans, distributors, and whoever. A copy of Creepers was given to Gallego, who offered a distribution deal to writer C.J. Johnson. 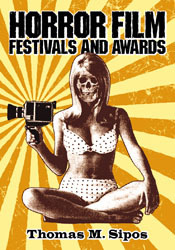 Gallego also made offers to several other Tabloid Witch short film winners. One WHC volunteer, Doug Kemp, especially loved Joe Fontano's The Butterfly Hole (2008 Best Animated Short Horror Film), and received a complimentary copy. Naturally, The Crypt Club and H.P. Lovecraft's Strange Aeons were much discussed, since those films sent representatives. But the biggest "buzz" was for Zombie Love (2008 Honorable Mention). Tommy Castillo not only loved it, but coincidentally, he said he'd done the cover art for it -- yet had never seen the film! Tommy had the DVD, on a stack of DVDs, which he'd given away about a week before WHC. He was kicking himself because "Now I have to buy my own copy!" Tommy added that Zombie Love was much better than the film that had been described to him -- but that was because Tommy was mistaken! He hadn't done the poster for Zombie Love, but for another film (with perhaps the same or similar title). "That's hysterical that Tommy said 'this film was much better than what was described'!" said Zombie Love writer/director Yfke Van Berckelaer to the Tabloid Witch. "Especially because it's a totally different film :-) I'm really glad he liked it though. I'll definitely get in touch with him. Maybe he can poster the feature if we ever get it made!" It wouldn't be a convention without drunken revelry! After a long day of panels, book readings, film screenings, and the art show, WHC attendees met in the hotel bars to drink up! 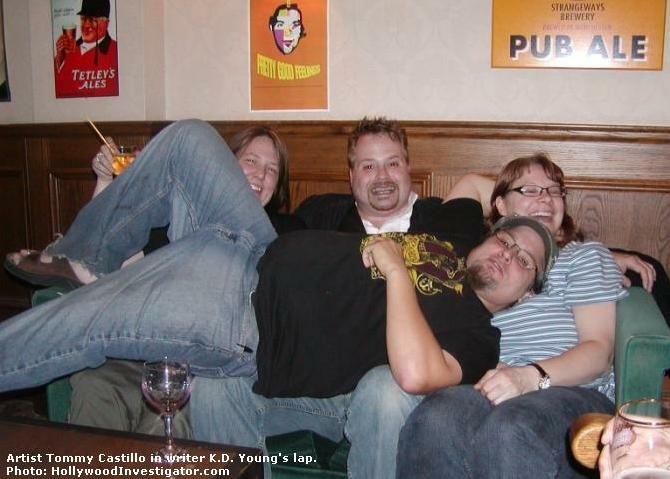 At one point, Tommy Castillo rested in the lap of Kelly D. Young -- and two lovely ladies! At about 2 a.m., Tommy regaled bar patrons by showing some skin! Yes, WHC attendees had much to drink by 2 a.m.! Author Scott G. Browne in background.